was conceived as an addition to the property’s, already highly successful guest lodge. Here thatched cottages are spread out along a cliff edge. Many artist and writers come to retreat and seek inspiration in this remarkable setting. flotation tanks, saunas, steam rooms and the like. The other components are retail outlet, restaurant, conference facility and library. The landscaping and pathways include a labyrinth, based on the Chatres Cathedral. The entire planning is based on a water and nature of water. 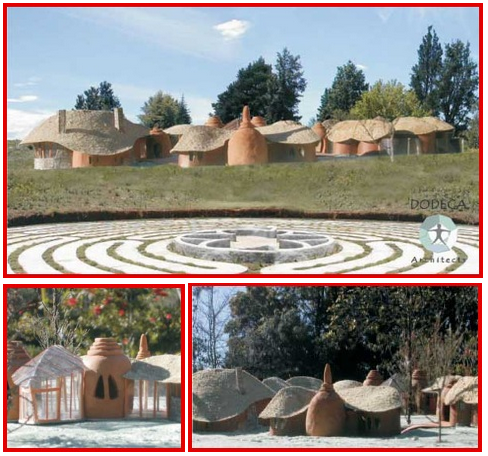 resulted in flowing cob forms which were complimented by flowing thatch roofs. The scale of all of the building is such that the components, roof beams, columns etc. are all at a human scale so that no heavy machinery is required. This project is conceived as a community uplifting program. The buildings are made of “cob”, where the raw materials would be harvested locally by the locals.